It's finally Friday so all you office minions can heave a major sigh of relief and look forward to 48 hours of weekend wonders. In the event you're feeling up to entertaining at home, thought I'd share some pictures from last week's Mediterranean Medley. There's no better way to spend the weekend than in the company of loved ones and friends! If you've hung around here for a while, you'll know that there's nothing I love more than cooking and entertaining at home. Be it thanksgiving, christmas, my birthday or for no good reason at all, I love having a table full of loved ones and friends enjoying the food I've prepared and each other's wonderful company. It is my very own personal definition of paradise - so I suppose I'm lucky in that I get to visit it as often as I want, so long as time, and my bank balance, permits it. Last weekend, we got a lucky group of seven together for a Mediterranean Medley. I love Singapore for it's endless summer, so a theme like this is never out of place - you can get fresh cut flowers all year round, and dine al fresco whenever you want. This isn't a difficult theme to recreate - and it's definitely easier on the wallet as compared to some of my previous parties. For starters, we had a watermelon+feta+mint salad. I tweaked Paula Deen's original recipe and gave it a mediterranean twist with the addition of a lot of kalamata olives, I then and added additional greens in the form of basil leaves to balance out the sweetness of the watermelon. I would recommend making this dish very early (it takes time to make those little watermelon balls using a melon scooper) and chilling it in the fridge for as long as possible, and adding the dressing and the feta cheese right before tossing and serving - it's a super refreshing way to start the evening, perfect for our humid weather. For the main I served up Grilled Chicken dressed in lemon and oregano. For this, I mainly followed Martha Stewart's Grilled Chicken with Lemon and Oregano recipe, added a couple of elements from Mark Bittman's Grilled Mediterranean Chicken Thighs recipe, and then I did it my way. I know it sounds complicated, but if you'd like to recreate the freaking incredible chicken (as described by 6/7 people at the table - I would not praise my own cooking so blatantly), then bear with me. You see, the problem with grilling chicken is that it always turns out tough on the inside and burnt on the outside (otherwise, if it's perfectly grilled on the outside it's still bloody on the inside). So I follow a two-step-tried-and-tested-many-times process. Yes, it is very mah-fan, but it is very worth it. Instead of marinating for 30 minutes at room temperature I marinated it for about 8 hours in the fridge (more flavour). After marinating it, instead of putting it straight on the grill, I roasted it in a pre-heated oven at 185°C for about 35 minutes. When roasting, add in a couple of elements from Mark Bittman's recipe to the roasting pan - namely the additional herbs (I used a lot of rosemary and thyme), slices of lemon, 2 onions (halved and placed directly under the chicken), and a whole garlic (just cut off the top - slow roasted garlic makes for a great condiment later on). Drizzle olive oil over everything before putting it in the oven. After roasting, carefully remove the lemon slices, onion, garlic, and herbs and place on the serving plate. Reserve the roasting pan juices. Place the chicken (skin side up) on the grill (heat should be on high) for a 3-4 minutes till you see those lovely grill marks. Flip over (skin side down) and do the same. 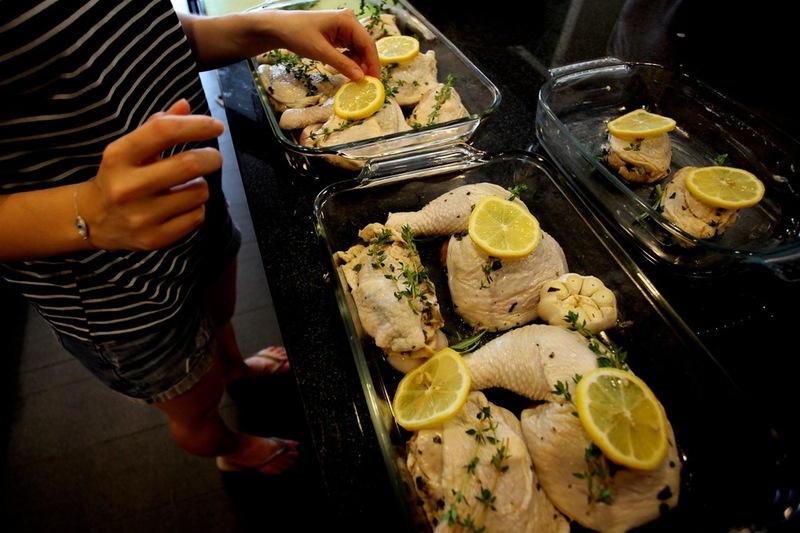 Put chicken on bed of onion, garlic, lemon slices and herbs, pour roasting pan juices over and serve. You see why this is superior? You get the best of both worlds! This method retains the juiciness (and the roasting pan juices!) of roast chicken, but you still get the lightly charred flavour of grilled chicken. Plus the slow roasted onion and garlic can't be beat when mixed in with a side cous cous! Speaking of which, I used this Lemon Garlic cous cous recipe which was delicious and light. I liked the addition of parsley - gave it a bit of bite. But again I tweaked it by using a lot more (sea) salt than what was recommended. You could also cook the cous cous in chicken broth instead of water for additional flavour. Along with the cous cous, I served herb-oil (rosemary and garlic) grilled vegetables as a side. I would recommend that you soak your sliced veggies in salted water for a couple of hours before hand to prevent them from drying out/burning on the grill. In addition to being quite the crooner, my lover, he's quite the pastry maker! P prepared dessert this time round (I'm not a fan of making dessert, a lot of it requires more precision than I'm used to - you can't mess with dessert recipes the way you mess with cooking ones), and he made the most delightful Modern Baklava. It was really freaking brilliant. 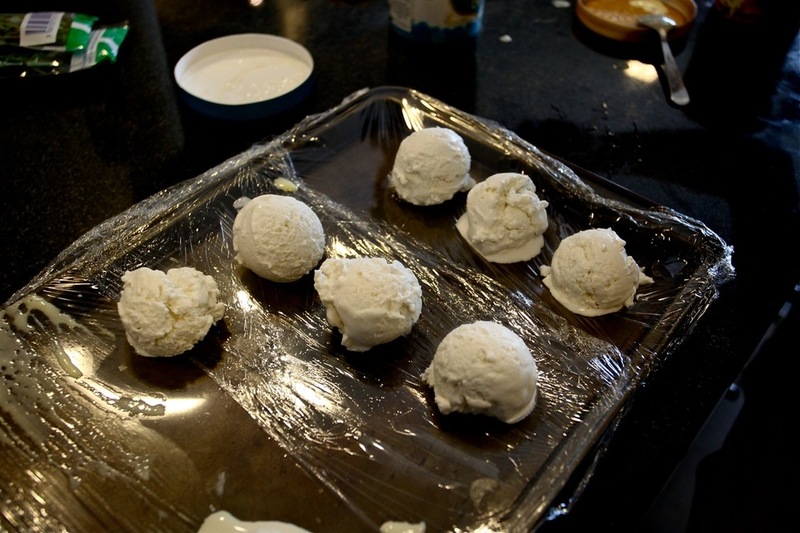 We tried our best to follow this Baklava Ice Cream Bites recipe, but the problem in Singapore is ice cream really melts too quickly! So if you can't get your ice cream to cooperate and re-freeze with the crushed nuts, don't worry, just sprinkle them all over the top before serving them in the phyllo pastry cups. Delicious stuff. The perfect note to end on. This explains all my happy weight. We served water and the red and white wine my friends brought along. 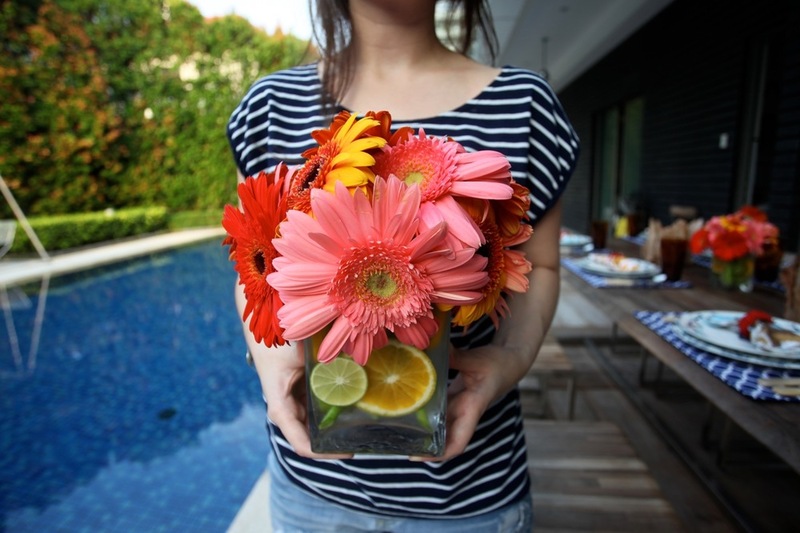 Add slices of citrus fruit to the water jug too if you want some extra colour on the table. And for those of you who love to entertain but hate the way it breaks the bank, well, the Mediterranean Medley menu was really easy on the wallet. The total grocery bill (sans dessert and drinks which my guests so graciously contributed) came up to about $100 for 7 pax which is just $14 per person. That's really decent. I normally budget $30 a head for dinners if I'm using beef, lamb, or fish... more if I'm using an assortment of seafood like shellfish. It would probably have been even cheaper if I'd gone to NTUC instead of Cold Storage -- but I never know where anything is in NTUC and Cold Storage is just so much friendlier. If you google "mediterranean" chances are your screen will be filled with beautiful images of the ocean, the sunset, white washed houses against and endless blue sea and sky, with bright injections of vibrant colour from the food or the flowers. I tried to recreate that at home. Fortunately for me, we have a whole set of navy-and-white dinnerware, so all I really needed to do was add some colour to the scene. The wonderful thing about this dinner setting was that the table decor was also incredibly easy on the wallet. Gerberas are great for decorating tables - they're bright and full and best of all, cheap! If you get them from the supermarket they're about $7 a bunch (and you only need one bunch/vase), if you get them from the wholesalers, it can be as cheap as $4.50. If you want to recreate this arrangement, just cut the Gerberas to approximate the height of the vase (so that the heads rest on the side). Do cut them in different lengths as the ones in the center need to be a little taller. Also? In our horribly hot weather, keep them away from the sun for as long as possible as they will wilt! And some add ice cubes to the water to keep them fresh and perky. I love using slices of citrus fruit to hide the stems which can look really really messy in clear glass holders! Not an issue if you use opaque vases. As it was an evening affair, I used candles to add a little soft lighting. You'll be able to find these block candles at IKEA for something like $5 (more for the larger ones), and you can use a simple clear vase to hold them or buy these rustic tree bark holders availabe on Etsy and Pottery Barn which are similar to what I have at home. Dinnerware is difficult to replicate unless you're willing to go out and spend money on a whole new set, but there are other ways to make the theme of blue and white come across more strongly. If you've just got a plain white set, there's a lot you can do with accoutrements like napkins and table runners. In fact, it's almost better that way because then there's no end to the combinations which you can play with. I thought these Safari Cotton Napkins and these Ikat Diamond Napkins from West Elm were adorable. Etsy's also full of deliciously colourful options like this chevron set or this circle set that reminds me of the placemats we have at home. I'm lucky that I have a navy-and-white set at home that even has a coral theme going on to match my Mediterranean Medley :) I like having coloured dinnerware around the house, it helps when it comes to creating different themes. In addition to the basic white set, everyone should have at least one additional set of coloured serveware at home. I really like this Blue Splatter Dinnerware Set from West Elm, it's got a hint of summer in it without being too overwhelming, it sort of straddles the line between being basic and just a little fancy. There's also this set from Z Gallerie - it's kind of kitschy but since it's on crazy sale it might be worth it if you have space to store an extra set. And that, my friends, is just about everything you need to recreate this Mediterranean Medley. It's actually quite easy, it just looks long because I'm a lot more verbose than I need to be! But trust me on the chicken. Trust me. Credit where it's due: Pictures courtesy of P and me.